A pregnant housekeeper has been allegedly murdered by a Satanic couple who tried to cash in on her £50,000 life insurance policy. According to noticias, the 41-year-old woman and 47-year-old man reportedly killed Atyla Arruda Barbosa, 20, by drowing her at sea last week. 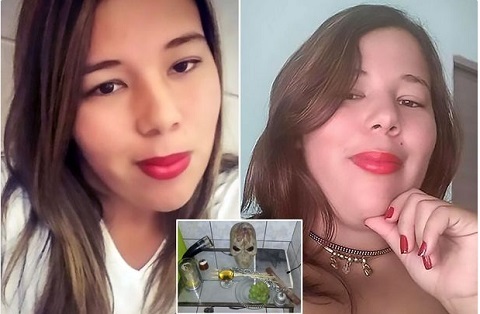 Her body was found on a beach in Mongagua, south-east Brazil. Now investigators have arrested the couple after finding Satanist objects, including statues, a dagger and skulls, at their home. It is alleged the man who employed Atyla Arruda had fathered her baby and, with his wife’s help, killed her to take her 260,000 Brazilian Reals life insurance cash. It is also alleged the man lied to Atyla Arruda by telling her his wife was unable to conceive. Barbosa’s employers reportedly told authorities the suspects were her godparents. But the victim’s mum told police this was false and a murder investigation began. The couple remain in jail while investigations continue.